Of the 30 American catfish species, the largest and most important is the blue (or Mississippi) catfish, an excellent food fish weighing up to 150 pounds. Best known is the smaller channel catfish, which reaches 20 pounds and has a deeply forked tail and slender body. The stonecat is about 10 inches long and is found in clear water under logs and stones. The bullheads are catfish of muddy ponds and streams, feeding on bottom plants and animals. Bullheads have square or slightly rounded tails and may reach a foot in length and weigh up to two pounds. The black, yellow, and brown bullhead species are common in the waters of the Central and Eastern United States. Fried catfish is a very popular food in the Southern, Central and Southwestern states. Usually served with fried potatoes, black-eyed peas or pinto beans, and cornbread, the tasty crumb-battered fish makes a delicious and hearty meal. Even people that do not usually enjoy the taste of fish will generally like eating catfish, because it doesnt have the traditional fishy taste that many others do. The fish itself is juicy and quite distinct in flavor. 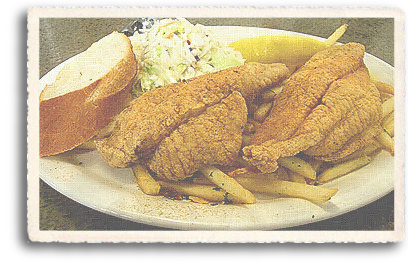  Pan-frying catfish consists of simply cooking the catfish in a pan on the stove top. Simply preheat the pan at medium-high with a small amount of oil or butter. Lay the catfish fillets in the pan once the oil is hot. When it looks as if the first side is done (which should take only five or six minutes) flip them over using a spatula or tongs and cook the other side. You should only flip once, and never more than twice.  Deep-frying catfish is a Southern specialty. This works best if you cut each catfish fillet in half, cross-wise. In a small dish, combine one half cup of cornmeal, black pepper, and salt. Pull the partial fillets through the mixture and pat down to make sure that it clings. Drop the fillets into hot oil from five to ten minutes or until lightly brown and crispy. Deep-fried catfish is very good served with cole slaw, hush puppies and tartar sauce.